One of the fundamental difference between user behavior on PC Internet and Mobile Internet is that on PC Internet user have a very generic learning curve . once you learn to use browser you can pretty much figure out working of almost every website on your own . 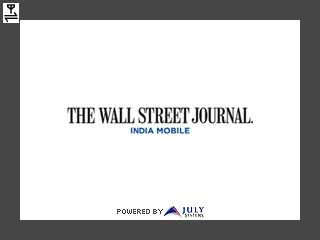 But when it comes to Mobile Internet specially applications based usage of mobile Internet , its not the case . each application has a specific use case, a different UI ,a different work flow ergo End user need to learn a new UI , new work flow with every new application. That's why its always good to keep the functionality of your app limited and User interface of your app very simple. your app should do one thing but it should do it well. 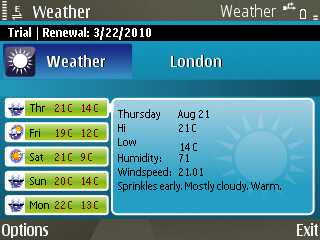 Weather Forecast application from a Delhi based Mobimonster2.0 is an good example of such application. You can download this application from http://mobimonster2.com/Weather.asp . with 441 KB in size it was a smooth download. Its compatible for Windows Mobile and All series 60 devices except Nokia 3250, N91 and 5500.It requires 100 Kb of space to run.It will appeal mostly to frequent flyer and executives. In that sense i was somewhat disappointed to see that there is no Blackberry version of the same . 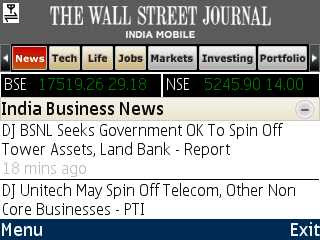 but I guess they will be releasing Blackberry version very soon. Weather forecast is a try and buy ,subscription application .You can buy an annual subscription for $10 only. This price point make it very attractive for frequent flyer.Weather forecast app provides you with an accurate five day worldwide prediction for any worldwide location/city. It provides with information such as High & Low Temp , Humidity, Wind speed and a general condition overview for next 5 days . Weather Forecast enables you to not only check for the 5 day forecast but also obtain the weather information by SMS (free service) for the next five days.you can select the time of day at which you would like to be informed of the weather. The application will send you SMS to be updated on the weather conditions.The application is compact, but that does not mean that it lacks in speed, reliability and accuracy. Mobimonster have a suit of such single use case applications in their portfolio. I will be writing about them on Lab report in days to come . in the mean time you guys give it a shot and let me know what you feel about it .